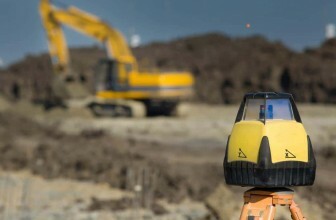 A laser level can be used for a variety of work. In today’s segment, you are going to know how to use a laser level to level ground. This is not a hard job, but you have to know the right steps. You can get the best laser level in the world, but if you do not know how to use it then you will not be able to get satisfactory results. We are going to give you a complete step by step guide. If you follow our guide then you will not have any problem when it comes to using a laser level to level ground. 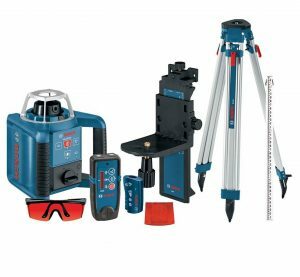 How to Use a Laser Level to Level Ground? First of all, you will have to purchase an adjustable leg tripod. Fixed leg tripods are not good for ground work. 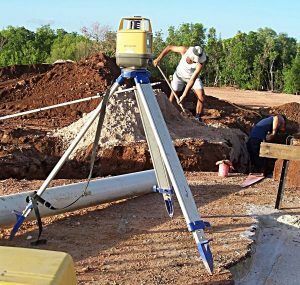 You can read laser level reviews and most of these reviews suggest the workers use adjustable tripods. It’s more versatile. Now set up the tripod on a stable ground. Attach the laser level with the tripod. Make sure that the laser level bubble and tripod bubble are at the same level. Keep adjusting until you get this right. A rotary laser level is best for the ground job, but in case you do not have that, get a self-leveling laser level. Find the spot where you will start working first. Take height from that place to the laser level. Now get a laser detector and a measuring rod. Attach them to each other. Laser detector will start beeping when it finds the level. Next, tighten the detector with the pole. The bottom of your measure rod is the height that you want. Find another point in the ground and do the same process again. Basically, you have to keep repeating these same steps until you cover the entire ground completely. This was the way to work with a laser level for ground level work. Now we have already mentioned that rotary laser levels are the best options to do the ground job. Today almost all big brands are making rotary laser levels. You may find it little overwhelming to find the perfect rotary laser level for the job. So we are going to do some laser level reviews about rotary laser levels. But before we begin, one thing we want to mention that there is nothing called the best Rotary laser level review. There are at least 3 products in the market that have almost same capabilities. So we are going to talk about 3 best laser levels in the market. 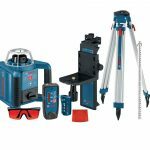 The top 3 rotary laser levels are Bosch laser level, DEWALT laser level, Johnson laser level. This is one of the most user-friendly rotary laser levels that you will get in the market today. This laser level is one of the top sellers in Amazon. So, let’s take a look at all the features of this product. Both horizontal and vertical self leveling. The entire set is perfect for any kind of outdoor work. This product does not come cheap. 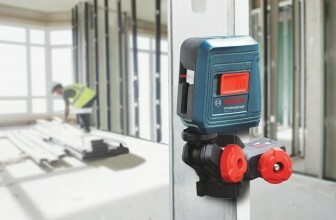 This Bosch laser level is currently used by some of the biggest construction companies in the world. 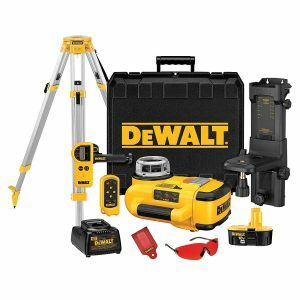 This rotary laser level set made by DEWALT is another great product to own. This laser level makes it easy to work on the ground laser. Standby mode helps the user to easily change the angle from vertical to horizontal. This product may create a little problem when you travel with it. 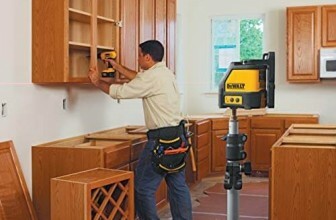 DEWALT is a trusted brand and of course their rotary laser level too is one of the best. 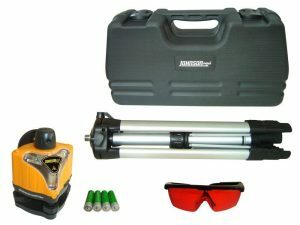 If you do not have much budget to purchase a rotary laser level then we highly recommend this product to you. It is very cheap and easy to use. Easy to change the angles. Signal light becomes less powerful after using a couple of times. This product is really cheap. It is without doubt one of the best laser level ever in this low price range. Where to get the laser level? This is another important point. You can get the laser level anywhere you want. But Amazon is the best choice. Not only because you can be sure that this online store will deliver everything to you in brand new condition, but they also offer discounts time to time. 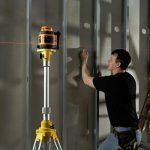 If you are thinking about doing a renovation in your house and want a cheap laser level then visit Amazon today as the store is selling all laser levels with a discounted price. Rotary laser level signals are very powerful. It can hurt your eyesight, so a pair of safety glasses is needed to be worn while using it. Only buy laser level made by the reputed brands. So this is what you need to keep in mind while using a laser level. Anyway, if you get one of these three laser levels and follow all the instructions then working on ground will be a piece of cake for you.